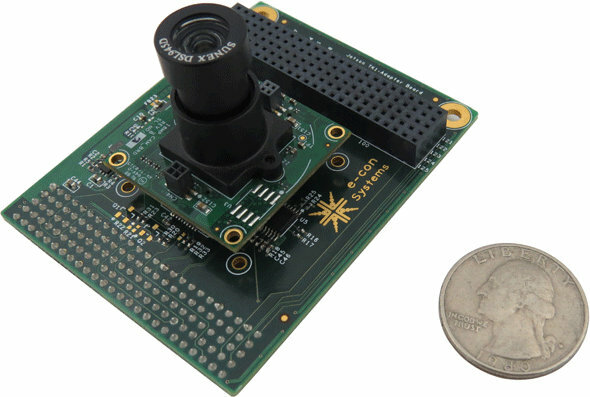 e-con Systems has just introduced e-CAM130_CUTK1, a 13 MP MIPI CSI-2 camera board specifically designed for Nvidia Jetson TK1 development board powered by Nvidia Tegra K1 quad core Cortex A15 processor supporting up to Ultra HD (3840×2160) resolution @ 22 fps, or 1080p @ 30+ fps with MJPEG or YUV422 output. based on Aptina AR1820HS sensor. Resolution / Frame rate – VGA @ 90 fps, 720p @ 60 fps, 1080p @ 30 fps, UltraHD (3840×2160) @ 22 fps, 13MP (4224×3156) @ 14 fps. Values are the same for MJPEG or YUV422. The camera supports Linux, with V4L2 camera drivers, and sample application with source code provided. 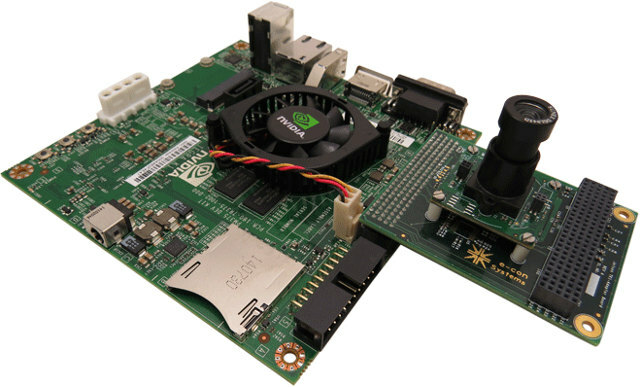 You can find documentation including the datasheet, and a getting started guide for Jetson TK1 in their documentation page. Android drivers are also being worked on. You can watch a demo of the camera in Ubuntu 14.04 with GUVC Viewer (ecam_tk1_guvcview) sample application. e-CAM130_CUTK1 camera board is available now, but price has not been publicly released. However, for reference e-CAM130_CUMI1820_MOD camera module used in this kit sells for $169 per unit, with the price dropping to $89 for 1k orders. Is anyone using this camera board? How is the frame rate ?? e-con Systems has now released 3.4 MP Ultra Low Light camera for Jetson TK1. It is based on AR0330 sensor and has excellent low light sensitivity – 0.1 lux! Recently e-con Systems has launched a 13MP autofocus UVC USB 3.0 camera with iHDR support based on AR1335 senso. See3CAM-130 supports 4K Ultra HD (3840×2160) at 30fps over USB3 in compressed MJPEG format. This See3CAM_130 can also stream Full HD (1920×1080) at 60fps and HD (1280×720) at 60fps.